A Drop cap is the first letter of a paragraph that is much larger than others and takes up several lines in height. 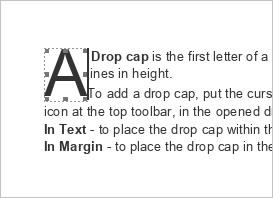 In Text - to place the drop cap within the paragraph. In Margin - to place the drop cap in the left margin. The first character of the selected paragraph will be transformed into a drop cap. If you need the drop cap to include some more characters, add them manually: select the drop cap and type in other letters you need. To adjust the drop cap appearance (i.e. font size, type, decoration style or color), select the letter and use the corresponding icons at the Home tab of the top toolbar. When the drop cap is selected, it's surrounded by a frame (a container used to position the drop cap on the page). You can quickly change the frame size dragging its borders or change its position using the icon that appears after hovering your mouse cursor over the frame. To delete the added drop cap, select it, click the Drop Cap icon at the Insert tab of the top toolbar and choose the None option from the drop-down list. Position - is used to change the drop cap placement. 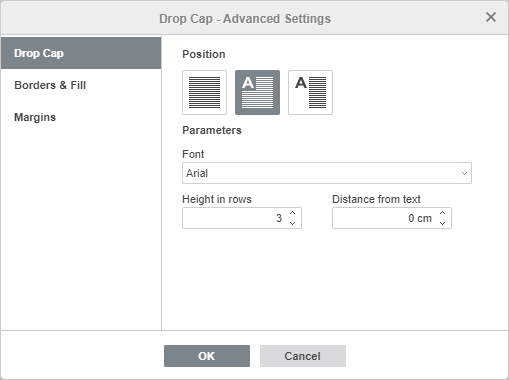 Select the In Text or In Margin option, or click None to delete the drop cap. Font - is used to select one of the fonts from the list of the available ones. Height in rows - is used to specify how many lines the drop cap should span. It's possible to select a value from 1 to 10. Distance from text - is used to specify the amount of space between the text of the paragraph and the right border of the frame that surrounds the drop cap. 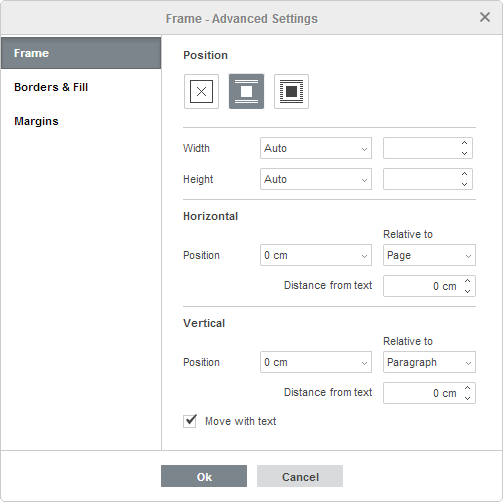 Border parameters (size, color and presence or absence) - set the border size, select its color and choose the borders (top, bottom, left, right or their combination) you want to apply these settings to. 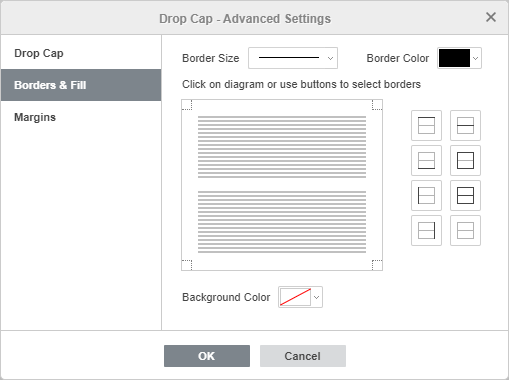 Background color - choose the color for the drop cap background. The Margins tab allows to set the distance between the drop cap and the Top, Bottom, Left and Right borders around it (if the borders have previously been added). Position - is used to select the Inline or Flow wrapping style. Or you can click None to delete the frame. Width and Height - are used to change the frame dimensions. 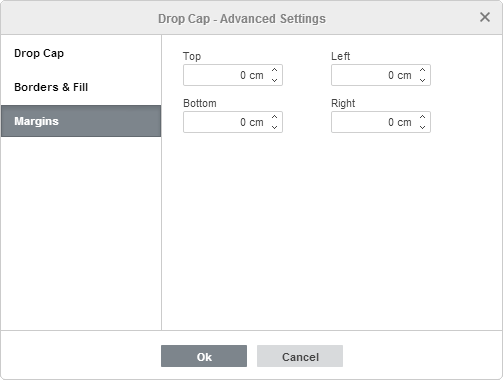 The Auto option allows to automatically adjust the frame size to fit the drop cap in it. The Exactly option allows to specify fixed values. The At least option is used to set the minimum height value (if you change the drop cap size, the frame height changes accordingly, but it cannot be less than the specified value). Horizontal parameters are used either to set the frame exact position in the selected units of measurement relative to a margin, page or column, or to align the frame (left, center or right) relative to one of these reference points. You can also set the horizontal Distance from text i.e. the amount of space between the vertical frame borders and the text of the paragraph. Vertical parameters are used either to set the frame exact position in the selected units of measurement relative to a margin, page or paragraph, or to align the frame (top, center or bottom) relative to one of these reference points. You can also set the vertical Distance from text i.e. the amount of space between the horizontal frame borders and the text of the paragraph. Move with text - controls whether the frame moves as the paragraph to which it is anchored moves. The Borders & Fill and Margins tabs allow to set just the same parameters as at the tabs of the same name in the Drop Cap - Advanced Settings window.